Meat / Steak Doneness | Is it Done Yet? I started my ‘FoodieFromTheMetro.com‘ blog (now taken down) because I wanted to document my food trips. And I don’t know if anyone noticed but I often include ‘Did-You-Know’ sections or fact tidbits in my posts because I believe that being a foodie isn’t only about the taste and the wondrous gulps, it’s also about knowing the dish before you. 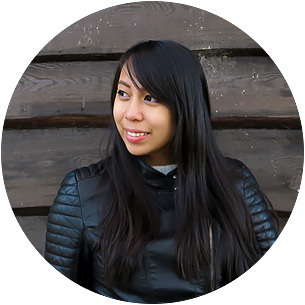 So in part, that’s also one of my intentions for this blog—educating myself and my readers. Putting that dramatic intro aside , I have come across articles of beef meat doneness—or beef steak doneness to be exact (the condition of being cooked to a desired degree) and I wanted to share it with you guys because apart from the fact that I love beef steak with a passion ♥, I also want to inform you on how you can best enjoy beef – wherever in the world you may be! Especially a medium rare wagyu beef! Aaaaah, now I’m craving for one! It is typically seared quickly for it to remain mostly red in the center. Once it is taken out of heat and left to rest, the steak should achieve the perfect tenderness and juiciness. This is said to be The Perfect Steak condition. Also seared and after doing so, it should be warm with the center mostly pink and becoming red towards the center. This condition will make the steak soft and juicy on the inside; though this is said to be past the point of having ‘The Perfect Steak’ state, this is actually my favorite ‘doneness’. This kind of ‘doneness’ has a mostly pink center, but it is said that grayish-brown colors should be more prominent than the pinkish color. This is specially drier and tougher than ‘The Perfect Steak‘. Only has a slight tinge of pink inside and will mostly be grayish-brown. This is often picked by those who want a slightly juicy steak without it having any signs of ‘red’ or ‘blood’ in it; this condition is way past the condition of being ‘The Perfect Steak‘. This is 100% brown with no signs of pink coloration and usually has a slight char outside. Well done steaks are said to be a waste of good steak meat; for those who favor this, it should be cooked very slowly on low heat or else it would become very, very, hard and chewy. What’s not included in the illustration above is the steak doneness called as ‘Blue Rare‘ (115F). This is not commonly done, but this is how die-hard carnivores can enjoy something very raw; it is said to be also seared on the outside, will be completely red and will be very difficult to chew. Juices will not even flow off/out the meat as easily. Isn’t Eating ‘Almost Raw’ Meat Bad? For chicken, pork, and ground beef: YES! But beef steak? NO. It is a different case altogether since it does not have the parasites that are found in chickens and pigs! Most of the time, bacteria lies only on the outside of a cut beef steak; therefore, just cook it well and handle it cleanly so that eating it ‘almost raw’ would be fine. Though as I have indicated, ground beef, is a different thing. Though it’s the same ‘beef’, given its ‘grounded’ nature, bacteria will be spread throughout. That’s why it’s best to go for a well-done hamburger since there are chances that you can get E. Coli from an undercooked patty. But the beef steak will have blood all over!? Besides, it is said that a beef steak would contain hardly any blood at all if it has been properly cleaned and prepared. I can honestly say that after learning these things, I am now perfectly convinced and I would love to try a rare steak next time as it is claimed to be the ‘Perfect Steak’! I must say I had a bit of fun playing with my fingers when I saw this. But there it is! I really hope this helps. Happy beef steak eating! 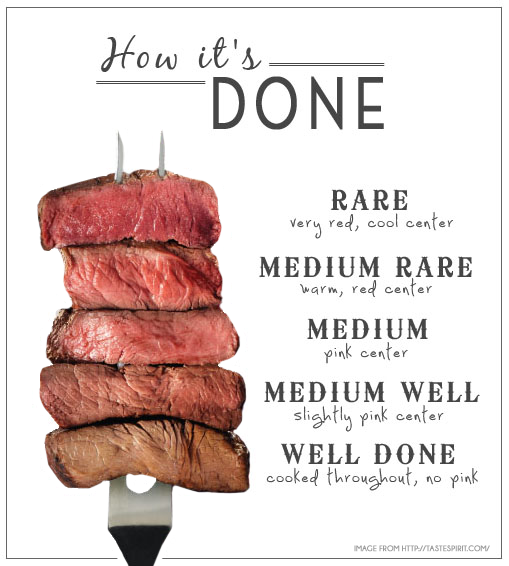 Rare, medium rare, medium, medium well, or well done? I normally eat steak medium. But just recently (as in like last week :P ) I have found out that as long as steak is dry aged perfectly - even if it's just dry aged for 10 days - makes one hell of an awesome medium rare :D ! I will still try to get over the redness of a rare or blue steak. and I thought medium or medium well was already good... Great article! Now I need to try eating them on medium rare or rare (didn't the guts before and I thought it was blood.). I'm a medium girl myself while my DTM is medium well.